Entering the small Gated Beach Community (only 4 lots), you'll find a Private Beachfront Home located just steps from the Crystal White Sand and Emerald Coast Waters, with 100.19 FT of Beachfront & Total Approx. Living Area of 6,639 Sq Ft ! 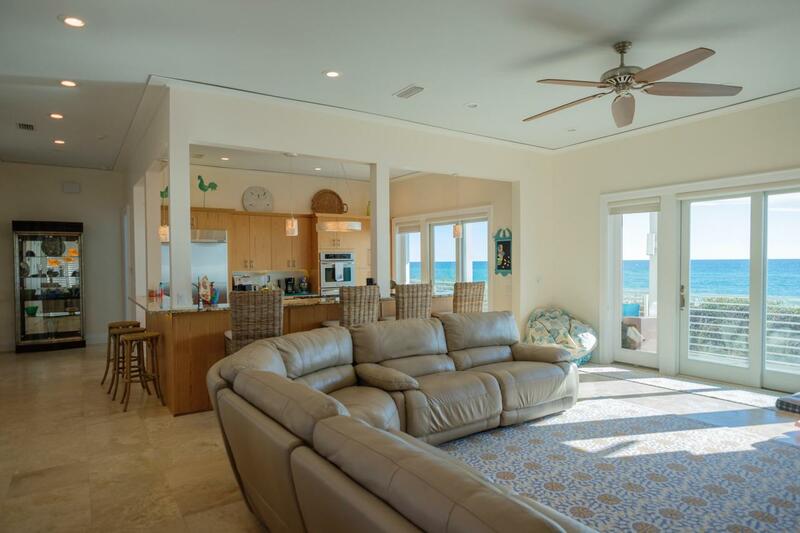 This Beachfront Home is equipped with an Elevator to take you from your spacious 2 car Garage to any of it's Four Levels, including a trip to the top, towering over the amazing Gulf of Mexico. These truly Spectacular views from each Floor offer the intimate & natural inclusion to all surrounding with a remind that you really are at the Beach. 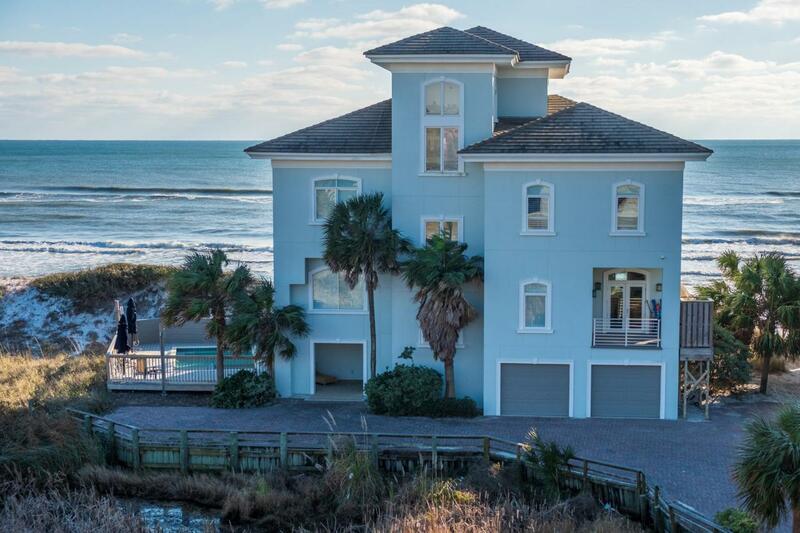 All 5 Bedrooms have complete views of these whispering Gulf Waters. Enjoy Balconies on all upper Levels including a private out-door Shower and a Level 1 heated Pool w/Hot Tub with a surrounding open deck. 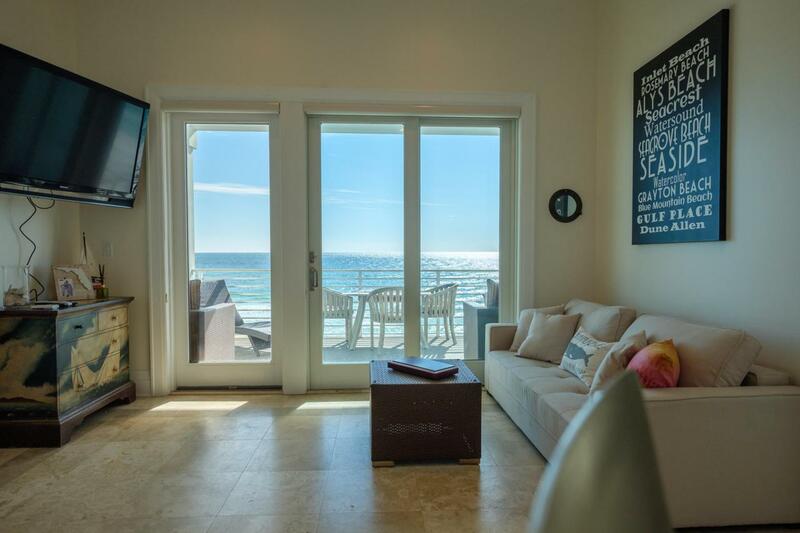 The18" Travertine Tile found throughout the Home is perfectly suited for the Beach and stands out against the high end finish woodwork. This striking Kitchen contrast surely delivers with the Stainless Steel Kitchen appliances (including a multiple gas burners, double oven & icemaker) accompaniment. Especially so, when enhanced further by a nuanced retro Lucite Countertop, elaborate Granite Countertop(s), the totally unique Tiger wood cabinets & modern designer lighting. The comfortable and relaxed flow of energy continues throughout the open living/dining area experiencing the combination of modern amenity uniting with a an overwhelming view of the stark free nature from every angle. A marble framed gas fireplace completes this warm yet powerful space. Considering also that the Home has basically multiple Large Master Bedrooms, each with it's own intimate View & closeness to the vast expansions of the Gulf. Also enjoy a wetbar & wine fridge in the roomy Family Room on Level 3 & a private Kitchen area in the Bonus Room Tower on Level 4. Seven Full Bathrooms throughout (including one with handicap access on Level 2) offer more of the clean spacious luxury with separate glass showers, pedestal sink, bubble & jetted tubs and marble. This Home has multiple high efficiency heating & cooling systems, spray foam insulation throughout & a special ultra-violet lighting in the air ducts. Exterior is fiberglass reinforced concrete stucco with a tiled roof. Nestled behind the Dune, the Broad Footprint that this Home was built upon and it's over 100Ft of Beachfront clearly enables it to realize its full potential...to compliment the free modern expression of design with a true awareness of nature's great wonder that is the Gulf and it's Beach. It is this lofty perch that sets this Home above and apart from it's Neighbors....it's truly a great place. The Owner(s) have never rented their Private Beachfront Home. However, the Huge Rental Income Potential is quite obvious. 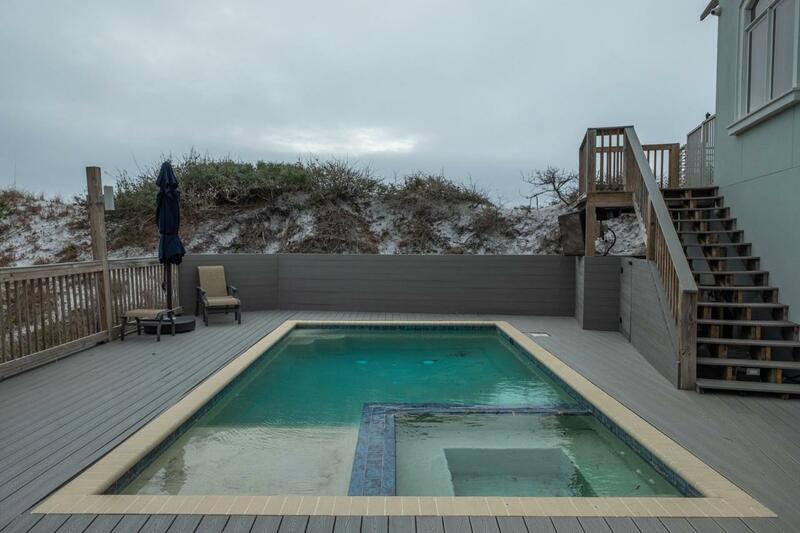 The Central proximity of this Property to everything Scenic 30-A gives it a unique advantage of convenience to any GulfPlace & Seaside events, Grayton Beach fishing, YOLO Rentals, SRB Club Golf, Grand Blvd. Shopping, Nearby Restaurants & Pub Galore etc. With enough spacious Bedrooms & full Baths to comfortably accommodate Large Family Vacations, Reunions & Wedding Guests. Great Memories Begin Here !